Enclosed find check ($4.18) from Bankers United Life for the balance due you from the stock exchange. I will put your new stock (30 shares – in the Bank in Kentland the next trip we make – which will be the 28th). For your own records it is BANKERS UNITED LIFE ASURANCE COMPANY Stock certificate CU 5801 – 30 shares – David A. and Bonnie Ruth Yegerlehner jt tn. We are slowly getting our house put in order. D. Schuh is making a couch over for me and we can’t buy carpet until that couch arrives. We are also going to bring the living room furniture to the family room so we can’t do much until he gets the couch delivered. We have the bedrooms just about finished. Dad has to make a headboard for the beds. I bought a new dressing table and chest of drawers and he is going to make the headboard to match. He has finished the shelves in the family room and I have most of the books in place – however not where I want them permanently. Some I am going to give away and if you want the ones I don’t want, you can have them. Dad is at present making a new stereo cabinet. Our living room is so small he is building a cabinet around the piano. Will send you a picture when he gets it finished. The living room is just about 12 x 17. The carpet we buy for it can only be 12 x 14 because of an offset where the piano is placed. We also have to get something else for the kitchen and I haven’t yet decided what I want. The Welcome Wagon caller was here today and told me about a place where rejects from National Homes are sold and that one can furnish a kitchen from the salvage store. We will go take a look (tomorrow I hope). The McClures are coming Wednesday to attend the I.U. presentation of Parsifal. They are coming at 5 and we are going to have dinner early because the performance begins at 7 PM. I know that is a lengthy opera, so it will be pretty late when it is over. You used to attend it at I.U. did you not? As I understand, they give it in two parts – before dinner and after. We went to Kentland last Sunday and attended a dinner at the Church given in our honor and a program at the gym in the afternoon. After the program refreshments were served and we stood in a receiving line and it seemed like we shook hands with everyone that attended, some say 300 others 500. I don’t know what the actual count was, but there was a large crowd. We received many well wishes and a beautiful bouquet of red roses from the Funks. The centerpiece was given to us after the affair was over and I took it and gave it to Mrs. Myers. She was ill that day and couldn’t attend. The Church gave us a plant. All in all it was a very nice and I have written twenty or thirty thank you notes. Bob Batton furnished me with a list of people who helped with the program at the gym. I asked Rev. McClure to put a thank-you note in the bulletin. We are attending church at Trinity. After we decided to go there Floyd (he and Ruth attended our party – also Aunt Ruth M) told us the minister here at Trinity used to be in Lebanon and they liked him very much. His name is Jim Morin. We went to Trinity the first Sunday we were here – Dad, John, Lea and myself. It is an old church but has a large congregation. You remember several years ago when you went to open house for the new parsonage for Trinity – in Vinton Woods? You went with Michels. Rev. Luke (minister at that time) would not live in the parsonage furnished by the church and persuaded the congregation they needed a new one. The old parsonage was torn down and a new educational building – where all the Sunday school classes are now held – was built. It is just across the street. The only difficulty we see about going there to church is parking. We had to walk 2 ½ blocks after we had parked. Sunday that was not bad, the weather being fair, but in weather not so good – well draw your own conclusions. [page 2] more time at home and can you believe, he will stay in bed until 8 o’clock when he doesn’t have to be at the Health Center until 9. I was afraid he had such a habit of getting up at 6 it might be hard to break that habit. At any rate we are beginning to enjoy more leisure time and enjoy some of the fringe benefits. We attended a special Easter Convocation at the Music Hall yesterday afternoon. We also have a color television set. A new store had a special offer for their opening and we probably got a $600 for $500, or maybe we didn’t. At any rate, we have seen several good programs so far on it. This house is not air-conditioned, so we bought a room air conditioner for next summer when we get one of those mid-west heat waves. John said he tried to get one last summer when a heat wave set in – we were in Europe at the time – and he couldn’t buy one – there wasn’t one to be had anywhere in Urbana-Champaign. We thought we would just buy one now and have it. We may not need it, but this is a frame house and I can imagine it gets pretty hot in the summer. One little tree out in front. This is a new addition to the city of West Lafayette and all the houses were built by a company that sells pre-cut houses. Some are rather nice looking. Ours is one of the rather plain looking types and the owner hasn’t done much to add to its charm. We are comfortable enough, but I still would like to have a house on one level. We haven’t discovered yet how to make the floor warm in this family room – this is one the lower level. We have signed a lease for one year, so we may be looking for something to buy by next March. However, prices are terribly high here and we may be just as well off in the long run to stay here and pay $165 a month. At least we don’t have to pay any taxes or insurance. We sold our house in Kentland. The Harris family has moved to Portsmouth, Ohio. John is going to stay in Kentland until school is out. They haven’t sold that property, or hadn’t when we were in Kentland a week ago Sunday. Mr. Harris is the manager of a Sears store – six stories high. Quite an advancement from the Kentland store. The young MD who took over our office (from what information we get from E & A) isn’t too happy with the situation. He told someone there was more work than he thought there would be. Edna receives payment for us every day and once or twice a week sends us the deposit slips and any information necessary. 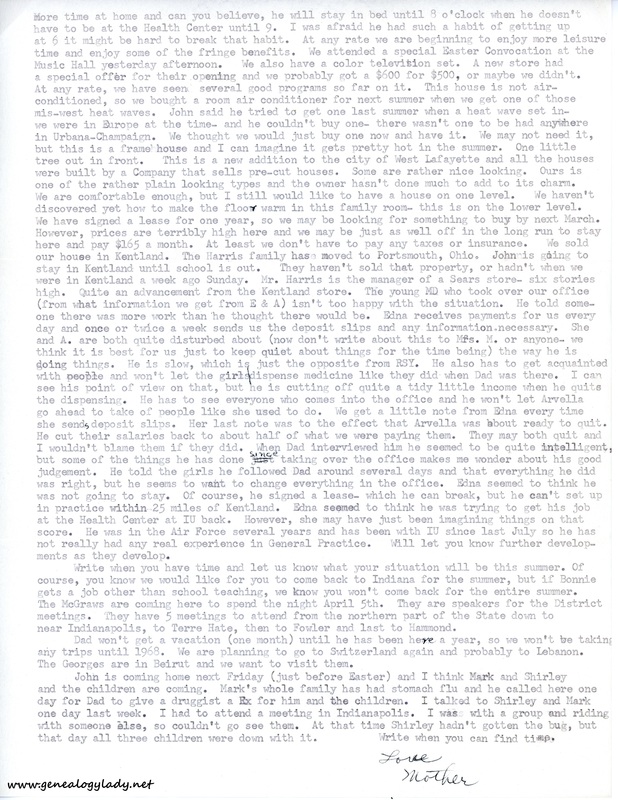 She and A. are both quite disturbed about (now don’t write about this to Mrs. M. or anyone – we think it is best for us just to keep quiet about things for the time being) the way he is doing things. He is slow, which is just the opposite from RSY. He also has to get acquainted with people and won’t let the girls dispense medicine like they did when Dad was there. I can see his point of view on that, but he is butting off quite a tidy little income when he quits dispensing. He has to see everyone who comes into the office and he won’t let Arvella go ahead to take off people like she used to do. We get a little note from Edna every time she sends deposit slips. Her last note was to the effect that Arvella was about ready to quit. He cut their salaries back to about half of what we were paying them. They may both quit and I wouldn’t blame them if they did. When Dad interviewed him he seemed to be quite intelligent, but some of the things he has done since taking over the office makes me wonder about his good judgment. He told the girls he followed Dad around several days and that everything he did was right, but he seems to want to change everything in the office. Edna seemed to think he was not going to stay. Of course, he signed a lease – which he can break, but he can’t set up in practice within 25 miles of Kentland. Edna seemed to think he was trying to get his job at the Health Center at I.U. back. However, she may just been imagining things on that score. He was in the Air Force several years and has been with I.U. since last July so he has not really had any real experience in General Practice. Will let you know further developments as they develop. Write when you have time and let us know what your situation will be this summer. Of course, you know we would like for you to come back to Indiana for the summer, but if Bonnie gets a job other than school teaching, we know you won’t come back for the entire summer. The McGraws are coming here to spend the night April 5th. They are speakers for the District meetings. They have 5 meetings to attend from the northern part of the State down to near Indianapolis, to Terre Haute, then to Fowler and last to Hammond. Dad won’t get a vacation (one month) until he has been here a year, so we won’t be taking any trips until 1968. We are planning to go to Switzerland again and probably to Lebanon. The Georges are in Beirut and we want to visit them. John is coming home next Friday (just before Easter) and I think Mark and Shirley and the children are coming. Mark’s whole family has had stomach flu and he called here one day for Dad to give a druggist a Rx for him and the children. I talked to Shirley and Mark one day last week. I had to attend a meeting in Indianapolis. I was with a group and riding with someone else, so couldn’t go see them. At that time Shirley hadn’t gotten the bug, but that day all three children were down with it. Write when you can find time. 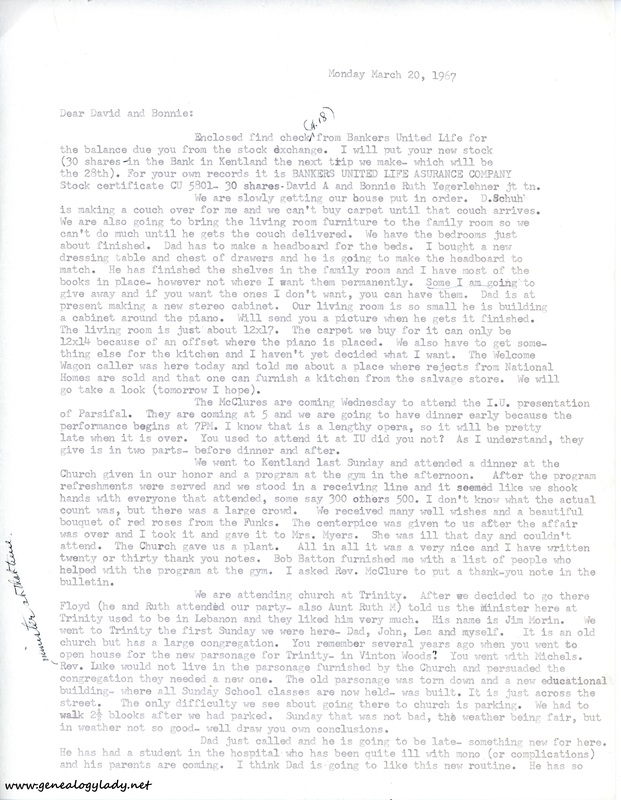 This entry was posted in Genealogy, Yegerlehner and tagged 1960s, Arvella Wright, Boston, David A. Yegerlehner, David W. Yegerlehner, genealogy, Gladys R. (Foster) Yegerlehner, Indiana, Kentland, Kirk Yegerlehner, Lafayette, Mark A. Yegerlehner, Massachusetts, Rebecca C. Yegerlehner, Roscoe S. Yegerlehner, Shirley (Ward) Yegerlehner on March 30, 2017 by Deborah Sweeney. “You used to attend it at I.U. did you not? As I understand, they give it in two parts – before dinner and after.” I think so, yes. And splitting into two parts is common. It’s nice to read about those farewell parties. “He cut their salaries back to about half of what we were paying them.” Wow, that’s terrible.